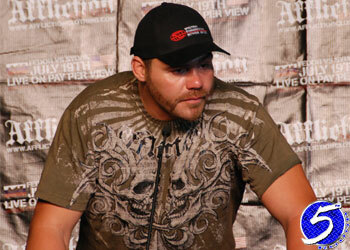 Former UFC heavyweight champ Tim Sylvia’s attempt at a pro boxing career continues to take some curious turns. After the New Jersey State Athletic Commission refused to sanction his bout against Ray Mercer, it now appears the two will box inside an MMA cage at Adrenaline III. Sylvia’s manager and Adrenaline MMA CEO, Monte Cox, confirmed that Birmingham, Alabama will host their boxing/MMA hybrid show on June 13th. The main event will be the only non-MMA fight. “It just makes sense on so many levels, and it adds another twist to the main event,” Cox stated about using the MMA cage for the featured bout. Although Sylvia will be making his boxing debut against a former Olympic gold medalist and WBO heavyweight boxing champion, Mercer is now 48-years-old. Sylvia hasn’t fought since he was humiliated in the 1stRound against WAMMA heavyweight champion Fedor Emelianenko at “Affliction: Banned” last July. The 47-year-old Mercer holds a 36-7-1 professional boxing record, which includes a loss to Wladimir Klitschko in a WBO heavyweight title bout in 2002. He was recently in the spotlight after losing an exhibition MMA bout to street fighting sensation Kevin “Kimbo Slice” Ferguson in 2007. Cox has been pulling double-duty the past few weeks after receiving word that the NJSAC wouldn’t sanction the boxing fight. Alabama does not have a regulatory body to oversee the fight. The Birmingham-Jefferson Convention Complex Arena holds 19,000 people. It’s highly unlikely that they will hit capacity.